Defiant in the face of an international backlash, President Donald Trump pressed into his second week in office defending his sweeping immigration ban _ and then fired a Cabinet head who refused to enforce it. Acting Attorney General Sally Yates earlier Monday ordered Justice Department lawyers to stop defending the executive order, which temporarily suspends the US refugee program and bars all immigration for citizens of seven majority-Muslim countries for 90 days. By Monday night, she was out. 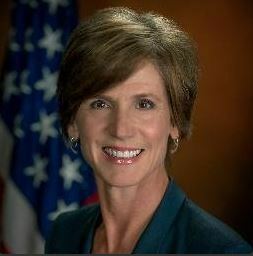 “The acting Attorney General, Sally Yates, has betrayed the Department of Justice by refusing to enforce a legal order designed to protect the citizens of the United States,” the White House press secretary's office said in a statement. Trump named Dana Boente, US Attorney for the Eastern District of Virginia, to serve in Yates' place until Sen. Jeff Sessions, his permanent pick for the position, is confirmed by the Senate. The Yates decision came as Trump pressed into his second week in office defending his sweeping immigration ban. Protests persisted at major airports, and concern mounted from US diplomats and members of his own party. Trump denied that his order was to blame for weekend chaos at the nation's airports, instead pointing to computer glitches, demonstrations and even the “fake tears” of Senate Minority Leader Charles Schumer. The president publicly shifted his focus, signing an executive action aimed at cutting regulations for small businesses and teasing his plans to unveil his Supreme Court pick Tuesday night. But the immigration ban remained at the forefront of his first fortnight in the White House _ and officials were pondering more actions moving forward. According to a draft document obtained by The Associated Press, Trump is considering an executive order that would target some immigrants for deportation if they become dependent on government assistance. The draft order calls for the identification and removal “as expeditiously as possible” of any foreigner who takes certain kinds of public welfare benefits. Such immigrants have been barred from the US for the better part of a century and they can already be deported. The proposed order appears to signal a Trump administration effort to crack down on such welfare cases. Another draft order under consideration would make changes to several of the government's foreign worker visa programs. The White House did not immediately respond to requests for comments on the draft orders. Trump immigration order prompted predecessor Barack Obama to wade into politics for the first time since leaving office. A spokesman for the former president said Monday that Obama “fundamentally disagrees” with discrimination that targets people based on their religion. Obama spokesman Kevin Lewis alluded to but did not specifically mention Trump's order but added that Obama was “heartened” by the civil engagement being seen across the country. Obama has said he will give Trump room to govern but will speak out if his successor violates basic US values. White House press secretary Sean Spicer said Trump's order was “about the safety of America,” while the new president played down its impact, saying on Twitter that just 109 people were detained and held for questioning. White House officials have said that was during the first 24 hours after the ban. But nearly 400 legal permanent residents were delayed upon their arrival back in the United States between the time the travel ban was signed and Sunday evening, according to a federal law enforcement official. All of those people were ultimately allowed back into the country. The official said one other green card holder is now facing deportation after an extra background check done after the executive order was signed revealed a criminal conviction. Details of that person's case were not immediately available. The official spoke on the condition of anonymity because the person was not authorized to publicly disclose details of the travel ban's implementation. Trump's order, which also halts all refugee admissions for 120 days, does not address homegrown extremists already in America. And the list of countries it applies to _ Iraq, Syria, Iran, Sudan, Libya, Somalia and Yemen _ doesn't include Saudi Arabia, where most of the Sept. 11 hijackers were from. A number of US diplomats also prepared a memo criticizing the order. In a “dissent cable” being drafted for State Department leadership, the diplomats said the ban runs counter to American values and will fuel anti-American sentiment around the world. The cable originated in the State Department's Consular Affairs bureau, which handles visas.